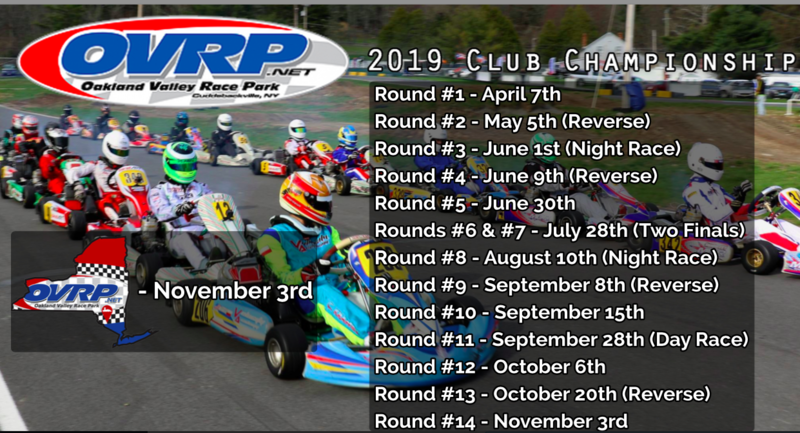 The 2019 OVRP Club Karting Season will be made up of 14 races. This exciting season will include 4 Reverse Direction races (with Saturday practice in reverse available), 2 Night Racesunder the lights, and a Double Points Race Daywith two Finals…your combined finish from both races will be used to determine the overall standings for the day…which will be worth double race points! As always, one dropped race will be permitted. OVRP will be add a new 100cc air cooled class tothe grid this season. This class offers a cost effective way to get involved in close, competitive kart racing. The class will include VLR, KA100, & KT100. The Schedule, Class Structure, and all Specificationsfor 2019 will be posted on the “Forms & Docs” page of OVRP.NET. OVRP will host 6 Club Races for motorcycleswith a Class Structure that will offer racing for Supermoto riders as well riders that were formerly part of MiniGP classes. Additionally, OVRP will host a round of the Supermoto East Coast Series (SMEC) in late August. The Saturday prior to a Sunday 2-wheel race day, will be limited to motorcycles and rental karts only. This allows track time for those who want to further develop their riding, but do not wish to race (yet). The Schedule, Class Structure, and all Specifications for 2019 will be posted on the “Forms & Docs” page of OVRP.NET. Spring / Fall Days of Operation:OVRP will be open Wednesday through Sunday. We are now closed on Mondays and Tuesdays in the Spring and Fall. Summer Days of Operation (June 10 to Sept. 8): OVRP will be open Tuesday through Sunday. We are closed on Mondays. The Retail Shopopens at 9am and closes at 6:30pm. Gates open at 8am. The Trackwill be hot from 10am to 6pm. Any adjust hours for Night Races or Special Events will be communicated via facebook and OVRP.NET. OVRP Membership pricing remains unchanged, as does storage costs for trailers or karts for each season. Members will also continue to receive a $20 discount on all Practice Day & Race Day Fees. Practice Dayfees are $65 ($45 for Members) plus $15 Pit Pass per person. Race Dayfees are $70 ($50 for Members) plus $15 Pit Pass per person. Please visit EnduranceKarting.com for full details and to sign up.